Berg's Blog – Integrating GREE into your cocos2d(-x) game ! Ok, now I assume you’ve setup the app on GREE and obtained the ApplicationKey, ConsumerKey and ConsumerSecret strings ! 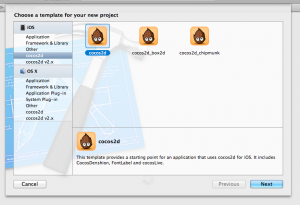 Let’s begin by creating a simple cocos2d game !, fire up Xcode, then create a new project (Shift+Cmd+N) and select the cocos2d template. Fill up your product name and company identifier, for this tutorial, i’ll just create one scene with a menu that’ll control GREE. 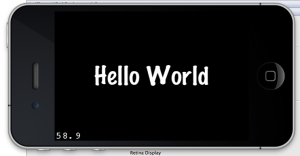 Now you should have the skeleton app ready to run, run it in simulator to make sure you see the Hello World scene, if it looks like this, you’re on the right track ! First method is the easier one, we simply copy two library archive files (something similar to DLL files in windows), those are precompiled files that contain the entire SDK header files and code. Simply go to your newly downloaded SDK folder, find the files calles libGreePlatform.a and libGreeWallet.a, then drag them into your Xcode window so they’ll be added to the project. Next you need to import the vendor/ folder, just in the same manner, this contains some extra libraries that Gree requires ! NOTE: There might be some extra example XCode projects inside the vendor folder, make sure to delete them as they contain similar filenames that confuse Xcode. To add the SDK as a source tree, simply find the SDK/ folder, and drag the source/ folder into your XCode project. we will need everything inside this folder. Once it’s in your project, you may rename the folder to something more appropriate, like libGREE. 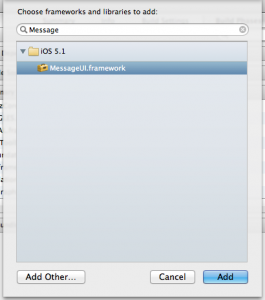 if you like an organised hierarchy, move the libGREE folder into the frameworks folder. Now we are done with adding the SDK, we need to add the resource bundles now (bundles containing images and UI elements required to display GREE’s dashboard,popups and banners properly). Resource bundles are found in the release/resources folder, head in there, and drag the file “GreePlatformCoreResources.bundle” into your project just like you did before, ask XCode to copy the file if needed. you may move it into the “Resources” too if you want to keep it organised ! Now we have resources ready, and code ready, what’s next ? adding the builder flags ! Scroll down to the “Other Linker Flags” row, and add the flags “-ObjC” and “-all_load” if they’re not already there. Now we’ve added the platform fully !, the next step is to add other frameworks that GREE requires to work properly, that’s simple and won’t take a moment ! Go to the “Build Phases” , next to the tab “Build Settings” you were just on, and scroll down to “Link Binaries with Libraries”. Tip: To easily find the framework use the search box ! Now we’re done with adding the framework ! !, we need to head next to our code to initialize it ! Now let’s go to the AppDelegate’s .m file and do some work there ! Note: GreePlatformSettings.h is not mentioned in the docs, but it contains the setting’s enums and constants, i’m not sure why this bug occurs, but we have to import that file manually, no biggie..
Now head to the end of your applicationDidFinishLaunching method, that’s where we’ll init the platform. To init, we need a settings dictionary, and your appId and consumerId/Secret. At this point, XCode will have probably started warning you about missing methods in the Gree delegate protocols, they are cool methods that allow you to do actions when the user logs in, out, or the dashboard appears, disappears, etc..
just add those methods to your AppDelegate.m file, anywhere you want. This means the platform was init’d correctly !, congrats !! You’re probably wondering, why didn’t I see the dashboard ?? Now go ahead and run your app (CMD+R), and it workes ! !, woot woot. 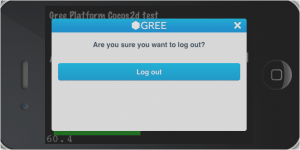 (Create a test user account on GREE’s developer dashboard to be able to login using that account form your device, you can’t register test accounts using your device, just do it via the developer dashboard, and MAKE SURE to activate the account by clicking the confirmation link). Now Login using the new credentials, voila ! you’re in GREE !, you may close the app and restart it, you’ll notice it greets you in a “welcome back, username” manner , just like OpenFeint and Game Center, nice..
And let’s handle it in a better way, we want the user to start the game, and if he/she aren’t logged in, we show them a login button that’ll call GREE’s dashboard, this way, we avoid annoying the user with popups (I hate that). We’ll handle those in the .m file, open it up now..
Clean out the scene from the Hello World label and everything, we want a clean empty scene..
Now let’s do a little check to see if the user is logged in or not to display the corresponding menu ! //If user is logged in, show menu, if not ask to authorize ! //No one logged in, show the login button ! Now run the game, you’ll be greeted with a nice empty scene with a login button, press the button, if the user never logged in before, it’ll ask them to register, if they’re already registered, the button will just disappear and the user will see the welcome back banner, this is a little tricky, cause now since the user is registered, you can just automatically call the auth method and they won’t see any annoying popups, i’ll leave that to you since you’ll know your game’s implementation better than i do, the easiest way is to simply call the auth method right after you init the Gree platform, but you must understand that the first time the player runs the game, they’ll see an annoying registration popup, keep usability in mind..
//User is Logged in, Show gree menu and info! //Check achievement status first ! //Get their profile picture ! //make it fade in, why not ?! //There's much more data than just the picture and the nickname, check the output in the console ! //Add 10 to score with every tap ! And the final and simnplest one, logout the user ! Don’t forget to replace the ACHIEVEMENT_ID and LEADERBOARD_ID with your respective values !, I’ve placed macros on top of the file for ya ! displayScale variable, it just helps with font sizes on iPad and iPhone and some positioning, etc… so don’t worry about those little changes..
to explain how the project needs to be built and to give some users having difficulties a ready made skeleton app to work on ! it also doesn’t show the GameCenter integration, I can add that later but i had no time as I’m contracted on a game that i’m supposed to finish soon..
sorry about that, if i have some more time i’ll make sure to post about GameCenter integration ! for not apparent reason (see video here). after some fiddling around the internet, I found out that it’s a little bug in cocos2d-x in the EAGLView, thankfully Andre Rudlaff has patched this ! 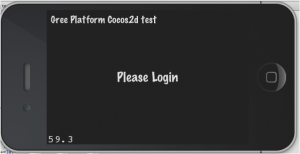 so after applying his patch, the rest was simply just exactly like Cocos2d-iPhone !. Enjoy, don’t forget to leave comments below if you have any questions ! Hi Berg! Thank you for great tutorial! It helped me a lot, but now I stuck with the dashboard. 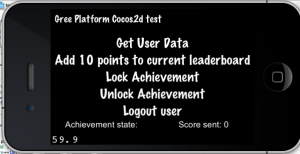 GREE docs describe “GREE Dashboard” that can be opened from game UI in order to show user his progress (like leader boards, user achievements). But I didn’t find a cue about this dashboard in the GREE iOs SDK Reference. Do you know how it works or where I can get more info on this issue? Yes there’s this feature, you need to initialize the GreeWidget to enable that , it’s basically a small Gree Button that stays on the bottom or top of the window, and once the player touches it, it loads the GREE dashboard, just like it worked on OpenFeint !, I’m not free right now to check out the docs, but if you look it up you’ll definitely find it, let me know if you don’t and i’ll come back to you with more info ASAP ! That’s sooooo great! Thanks for this tuts!!! Finally what I was looking for! Thanks dude! I have some problem with gree project , i downloaded xcode project as it is , and run it but i got “some thing went wrong” .. any help ? I need more details to be able to help with anything ! Shouldn’t this work? Have you seen this or know off the top of your head what I’m missing here? Hi Stuart T , i stopped in same code , did you find a solution? The rest runs ok , but the Gree window doest appear , i think there is some different flow inside coco2dx viewController. Hey, Gustavo! I isolated the issue. It’s really, really simple, it turns out. At least it was for me. When you access it with self.window…. it crashes. Maybe that will help! Below to Berg, I posted the complete function if you want to look at it. Yeah I ran into the same problem with cocos2d !, it had something to do with setting the rootviewcontroller properly ! From your code I don’t see that you’re setting the RootViewController property !, this is the main cause of the authorize not showing ! if you can send me a bigger snippet of the code I’m sure I can help ! you can also email me and i’ll update it to the post here cause sometimes it’s hard to follow the comments ! Thank you so much for your offer to help. With a fresh set of eyes, a cup of coffee and my debugger I figured out what was wrong. 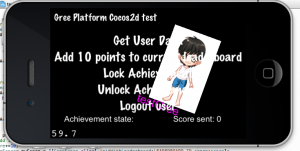 With cocos2d-x you only need to modify your existing post a tiny bit to work! After all that effort! hah! // Add the view controller's view to the window and display. Feel free to add this in, leave it where it is, or whatever. But thank you for this blog post! Hey stuart !, just saw that comment now ! please email me the project file as this is very interesting !, i’ll happily take a look at this guy for ya ! Hey Jason, sorry about that i just noticed i accidentally deleted the files while moving to my new laptop :(, i’ll do my best to retrieve them ASAP ! I can confirm that both download links are broken and hope you will update them. Thanks for the great tutorial!